ORDER Pascoe’s Detox Kit® and receive the complete solution kit for the SAME COST as the regular Pascoe Detox Kit pack! Ready for your cleanse? Get Balanced first! 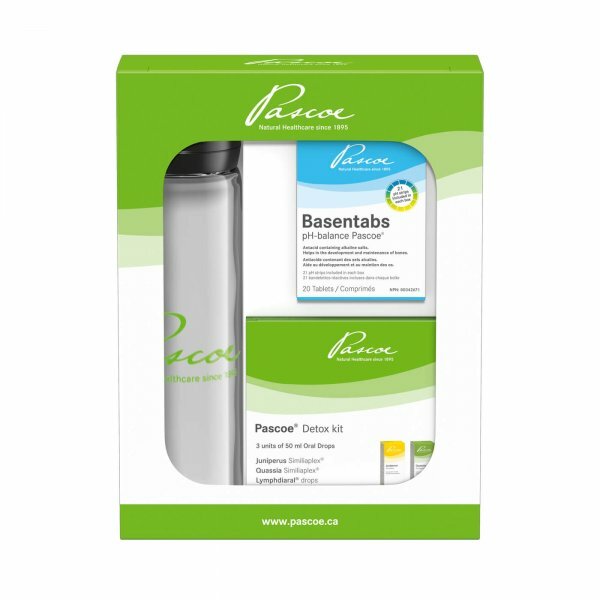 Pascoe Detox Kit Promotional Pack includes 1 Pascoe Detox Kit, 1 Basentabs pH-balance 20 tabs and 1 glass water bottle. Alkaline salts help neutralize the toxins released during detoxification. Basentabs pH Balance Pascoe® is an antacid containing alkaline salts, which improves the results of the Pascoe Detox Kit®! Learn more about Basentabs here. Pascoe® also recognizes that water is the key to detoxifying our body! Learn more about the Pascoe Detox Kit here – includes Juniperus Similaplex, Quassia Similiaplex, and Lymphdiaral and lasts up to 5 weeks. For ingredients of the Pascoe Detox Kit click here. For ingredients of Basentabs click here. For dosages of the Pascoe Detox Kit click here. For dosages of Basentabs click here. For contraindications of the Pascoe Detox Kit click here. For contraindications of Basentabs click here. I love this detox kit and combination. The water bottle is a great bonus. I've done many cleanses and by far this is one of the easiest and most notable. Great to have it packaged with Basentabs as well! Great cleanse program that is effective, well-priced and of a good duration. I noted improved symptoms within a week of starting it.